2.4GHz The Volcano S30 replaces the Volcano SV. We upgraded the popular Volcano SV with an SH brand engine, performance header and aluminum tuned exhaust. Feel the the eruption with the powerful Volcano S30! 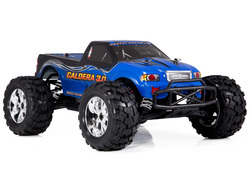 Featuring a potent nitro fueled 3.0cc SH-18 engine, tuned exhaust, performance header, durable 2.5mm thick aluminum alloy chassis, 4-wheel independent suspension and 8 oil filled aluminum capped shocks, the popular Volcano S30 has the explosive accelerative force of a miniature Mount St. Helens. This 4X4 ready to run brute boasts a polycarbonate bash-resistant body, composite disc brakes and huge soft compound RC off road tread that’s sure to trample the toughest terrain. A 2-Speed sealed transmission, explosive SH .18 3.00cc Nitro engine & slide carburetor make the Caldera 3.0 a volatile mini Mount St. Helens on or off the track. Faster acceleration leads to high octane excitement with this 4X4 monster truck equipped with aluminum alloy chassis, 4 big bore oil filled aluminum capped shocks , polycarbonate bash-resistant body, composite disc brakes and much more. 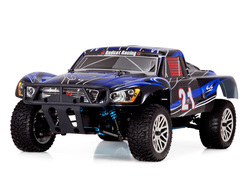 Whip up some major dust devil’s with the intense new Vortex SS Short Course Truck! 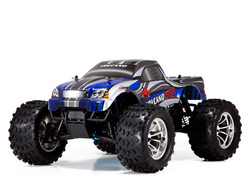 This 4X4 ready to run nitro truck boasts a durable polycarbonate crash-resistant body, composite disc brakes and huge soft compound RC off road tread that’s sure to keep this sand-swallowing beast tracking straight through the roughest terrain. This dune basher features an air cleaner assembly composed of a heavy duty foam element to keep dirt, dust, and other debris out of its powerful nitro fueled 3.0cc SH-18 engine. A resilient 2.5mm thick aluminum alloy chassis, 4-wheel independent suspension, 4 oil filled aluminum bodied shocks, 2 speed transmission and many other high performance features give this beast an explosive edge over the most difficult dunes.